In Full Used Car Salesman Mode, John Legere Says Google Attacked Binge On Throttling To "Get Into The News"
In a video released today, John Legere - CEO of a publicly-traded wireless carrier and, apparently, your sort of out-of-touch uncle - accused Google, a $517 billion search company, of attacking T-Mobile's Binge On service in order to "get into the news." As to what Google's end in such an endeavor might be, well: John just doesn't know. It's shadowy, it's dark! They have an agenda. In what is frankly an almost uncomfortably defensive clip, Legere's cultivated public persona continues to deny that Binge On's throttling of all video content is throttling. Instead, everybody's favorite wireless CEO focuses on the fact that you're getting more video! Do you see that video over there? There's more of it! Isn't that great? Throttling? You mean more video? That's what I thought you said. 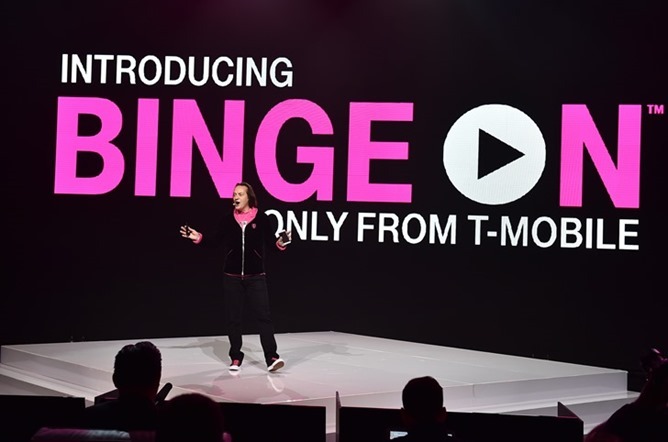 Legere provides no strong technical or semantic defense of T-Mobile's Binge On service, instead preferring to shift the conversation to customer benefits. Earlier this week, the EFF weighed in on Binge On, and their informed take is essentially the same as the increasingly prevalent viewpoint: Binge On is throttling, and that's all there is to it. They even went so far as to contact T-Mobile and confirm that no optimization whatsoever occurs to throttled video on Binge On, T-Mobile just puts a hard cap on the amount of bandwidth available for any and all video. In other words: it's marketing (and throttling). And that's what John Legere's video defending the service today is, too; nothing more than an attempt to rally T-Mobile's most ardent supporters and fans into drowning out any criticism of anything the company does. Is Binge On the worst thing to happen to net neutrality? Of course not. The slippery slope argument is there, but the real issue is that T-Mobile has done a piss-poor job of informing its customers in an up front, direct manner just what the service does, and by auto-enrolling all eligible subscribers, guaranteed that most will never fully know what it is they've been signed up for. I'm with the EFF on this one: Binge On should be opt-in, and T-Mobile should drop the pretense on the throttling issue. The only reason they're so keen on avoiding that word is fear that the FCC will step in, which at this point seems at least somewhat likely anyway. In the meantime, John Legere will likely continue in his impassioned defense of Binge On with more videos and blog posts, in what I believe might be called an attempt to "get into the news."